Mannhattan has proven himself not only in the performance arena, but in the breeding shed as well. In 2013, he had no fewer than three offspring competing at FEI in Dressage, as well as several competing in the hunters, jumpers and eventing! With his versatile pedigree well known for producing talent for all disciplines, as well as being well known for producing offspring with fabulous brains and excellent work ethic, he is suitable for a wide variety of mares. Microburst is a 2001 gelding currently competing successfully in the hunters. This lovely gelding is currently available for lease or purchase from Entropy Farm! Microburst is a full sibling to our top broodmare, Morticia, as well as our 2011 filly, Morgana d'Avalon. Faberge' is confirmed in foal for a repeat of this incredibly successful breeding for a 2012 foal! If you are interested in purchasing either Morgana or the 2012 foal, please feel free to contact us! Morocco was foaled in 1995, by Mannhattan x Pink Agate by Agate Court. 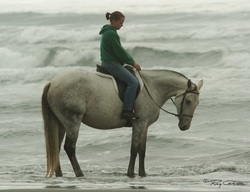 He is a 16.1hh Grey Oldenburg Stallion. Licensed for Breeding with BWP/NA, Old/NA, RPSI. As a 5 year old, Top Dressage Horse Morocco finished his first full year of showing with the USDF as the Number 1 Oldenburg in the United States at 1st and 2nd Levels. 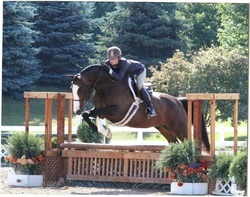 He was also number 1 Belgian Warmblood in the US at 1st and 2nd levels. Overall, Morocco was ranked in the top 20 horses in the US among all breeds competing at 1st level and at 2nd levelHe earned a dressage score of 84.6%, with all 9’s in the collective marks at a sanctioned AHSA/USDF Show. Morocco won the USDF Region 5 Championship in 2000 at 1st level. In 2003, Morocco won 10 of 13 classes at Prix St. Georges, including a win in California at the Festival of the Horse/Burbank CDI***. No:1 in the US with USDF All-Breeds Awards at Prix St. Georges. Morocco often earns 9’s on gaits, 10’s on extensions, and has numerous scores above 70% at FEI dressage from top international level judges. His passage, piaffe, and extensions are natural talents. Bred by Dr. Janet Distler, Mazurka is a lovely gray mare with exceptional conformation and gaits. She was the high score Oldenburg/ISR competitor in 2005 at a large regional breed show and was in fact 3rd highest score overall in that show across all breeds. was bred by Barb Young of Rainbow Farm. A stunning mare, she scored an 8.5 at her foal inspection and was the third highest scoring foal in the nation that year with the ISR/Oldenburg N.A. She has gone on to be the USDF 2004 Regional Champion Filly, USDF 2005 Regional Reserve Champion Mare, Region V Training Level Champion, USDF 9th in the nation AA Training Level with scores in the mid 70's, 2006 USDF 6th at AA First Level, Oldenburg HOY Open and AA First Level, 2007 USDF HOY 2nd Level AA Champion, 2007 USDF HOY 2nd Level Open (5th) under her owner/rider Julie Hesse, DVM. Congratulations to both Julie Hesse for her riding successes and Barb Young for producing this lovely mare. We expect to see continued success for the pair. As a foal Sierra went premium with a score of 8.5 for the Oldenburg N.A. filly. Sierra was one of the highest scoring foals for the Oldenburg N.A. of 2001, tieing for the 3rd highest score in the country. As a three year old, Sierra won both the 3 year old Sport Horse Fillies class and the champioship at the prestigious 2004 Scottsdale Arabian Show. She then became Champion Half Arabian Sporthorse. Mercury II was bred by Margaret Plumley of Plumley Farm. He is out of the Canadian Sporthorse mare, Lulu. He is currently competing under an amateur rider in upper level dressage. Mata Hari was bred by Avalon Equine. She was out of the mare, Idealiste who, despite her parentage, only matured to 14:1 hh. Idealiste was out of the Anglo Arab mare, Smokey Storm (15 hh) and by the Oldenburg stallion, Ideal (16:2 hh). Mata Hari was Autumn St. Martin's dressage mare and introduced Autumn to riding and the show ring, as well as a super driving horse. Demonstrating the gaits and temperament her sire is known for stamping his offspring, she was a wonderful "first horse" for Autumn. Mata Hari went on to produce the fully licensed and approved German Riding Pony, Belafonte d'Avalon (Hilkens Black Delight x Mata Hari). 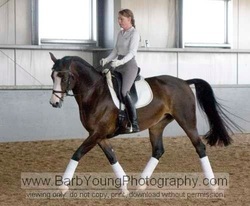 Mati will be bred to the German Riding Pony, Adonis in 2013. Congratulations to the following horses and their owners! Baby Green Hunter Under Saddle - 2'6"